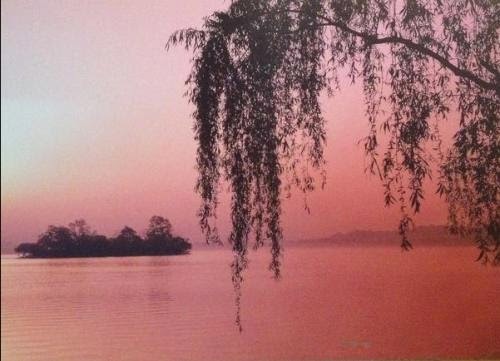 Postcard CN-1291364 from China shows West Lake (西湖), a freshwater lake in Hangzhou, eastern China, that has inspired famous poets, scholars and artists since the 9th century. There are numerous temples, pagodas, pavilions, gardens and ornamental trees, as well as causeways and artificial islands. It was inscribed on the UNESCO’s World Heritage List in 2011 as the West Lake Cultural Landscape of Hangzhou, comprising the West Lake and the hills surrounding its three sides, described as having "influenced garden design in the rest of China as well as Japan and Korea over the centuries" and reflecting "an idealized fusion between humans and nature."